Momma Told Me: Sometimes success is painful. It's that time again. Tax time. This year I reached a milestone in taxes owed- something those older than me are quick to remind me is in fact a blessing in disguise, not a curse to be lamented over. After all, when one's taxes go up that means their income has also increased. More profit, more taxes. Somehow I'm not quite at the jumping up and down phase of acceptance, yet. On the other side, Jay seems to have balanced his deductions, at last, to actually break even with the IRS come tax time. He no longer sees a Federal refund, but had a decent sized State refund coming back to him. Since we're not married, I had the solo joy of watching my piggies fly out of my bank account as Jay watched them fly into his. Whether you're paying taxes or enjoying a refund we can all agree that this is one time of the year when we all want to stretch our buck a little extra further. Thankfully Walmart Family Mobile, and their wide selection of affordable plans and phones can help me max my tax time dollars. All prices for phones and plans included in this post are accurate as of the date of posting; however, these prices are subject to change. Please refer to http://cbi.as/7e-jr or your local Walmart for current pricing.) 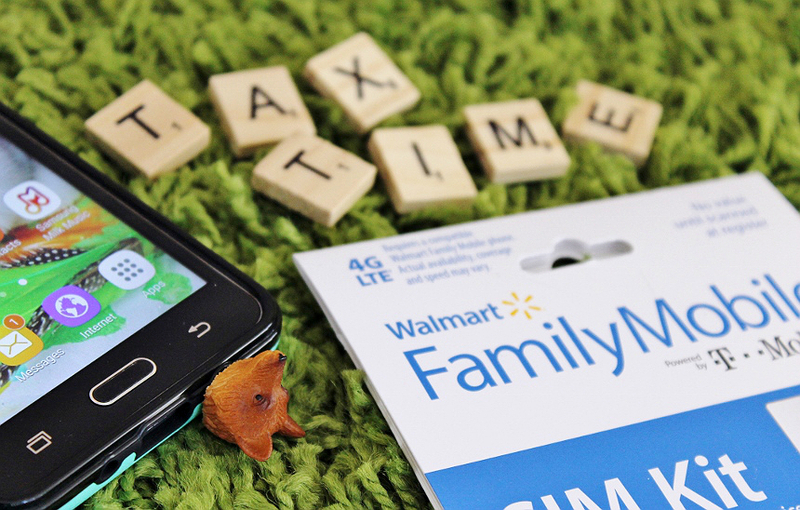 Signing up for the Walmart Family Mobile Plus plan is as easy as visiting your local Walmart and picking up a $19.88 SIM Kit. The SIM Kit, and your phone of choice, is all you need to get started making calls, and enjoying unlimited* data right away! At the end of last year my old phone began to reset itself multiple times a day and lock up- so I was excited to find the Samsung Galaxy On5 on rollback for $69 at my local Walmart. 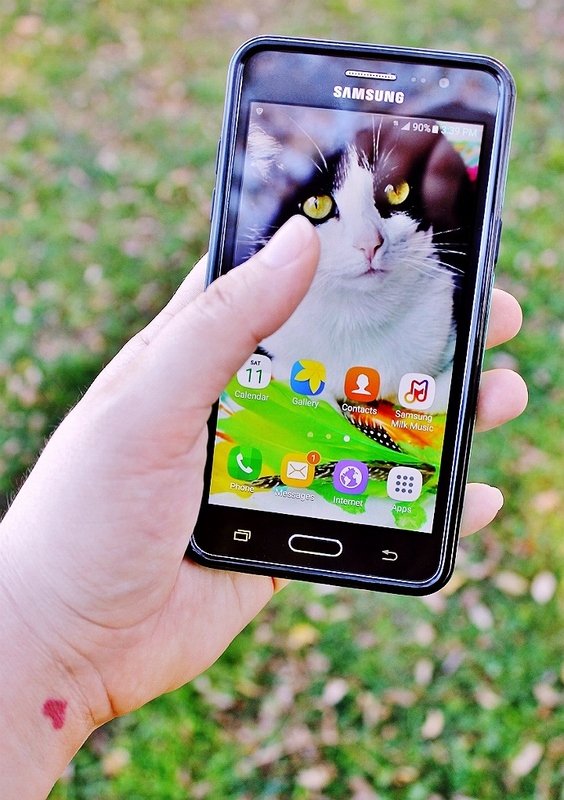 It offers all the same features as my old smartphone, such as a high quality camera, WiFi connection, Bluetooth, responsive touch screen, and more. Even better, I get amazing service in and around my with Walmart Family Mobile's network. (Check your coverage here!) And I love that I can be single and on my own smartphone plan without breaking the bank each month, or signing a contract! I'll admit- I use my phone a lot to keep up with work and social media, but I use it even more to keep myself entertained while on the go. 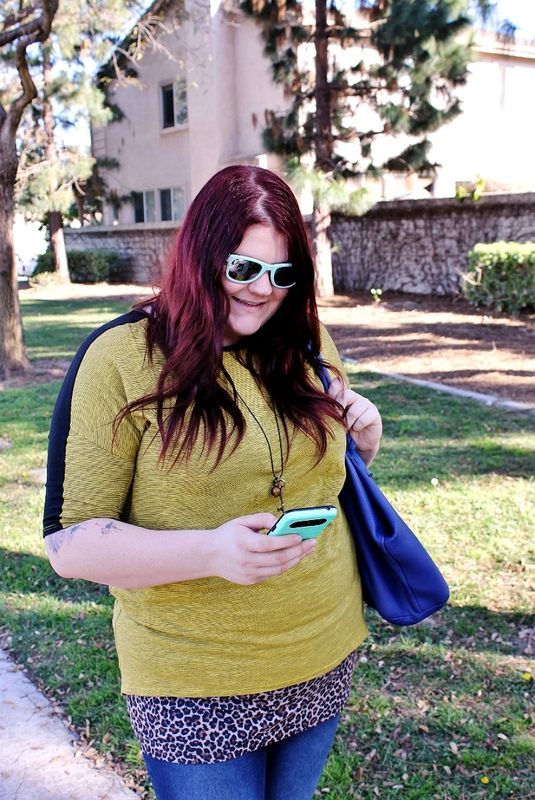 Yes, I'm that one girl who's stopping on the sidewalk to swipe her screen up a million times trying to catch a rare creature, or pulling out her battery pack and earbuds in line at the DMV. I use a LOT of data, and data doesn't grow on trees (it grows on clouds, silly!) Which is why having unlimited data (*Includes up to 10GB of 4G LTE† data then 2G) for one flat monthly rate, with Walmart Family Mobile, is worth it's weight in gold to me. I was feeling pretty proud of myself for snagging an amazing deal on a new phone, and putting my lack of tax return to good use by saving money on my mobile plan, that I got a little inspired. I really wanted to dress my new phone up a little with something I didn't see in every store or boutique, so I picked out a few children's animal figures from the toy department at Walmart. I also grabbed some crafting suction cups, super glue, and a box cutter. For those who want to go truly all out you can find clear acrylic dust plugs to make your own smartphone charms online. 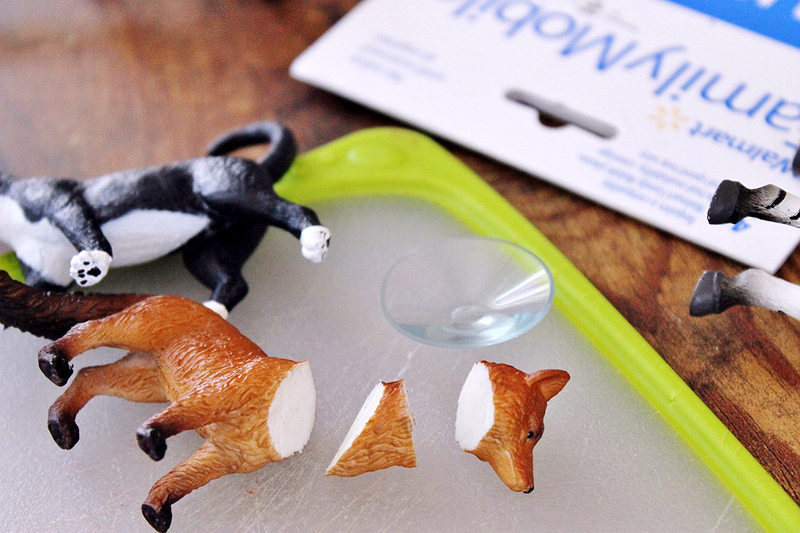 The concept's simple, really, on a flat, stable, blade ready surface (such as wood or a polypropylene cutting board) carefully slice the head off your chosen animal figure. Use slow, targeted, strokes and be patient. Good quality toys will be made from a rubberized material that will be easier to cut, while cheaper figures may have a harder plastic finish with a hollow center. Depending on the animal you may want to cut the head at an even horizontal cut, and then cut the remainder of the neck to leave a flush vertical surface. 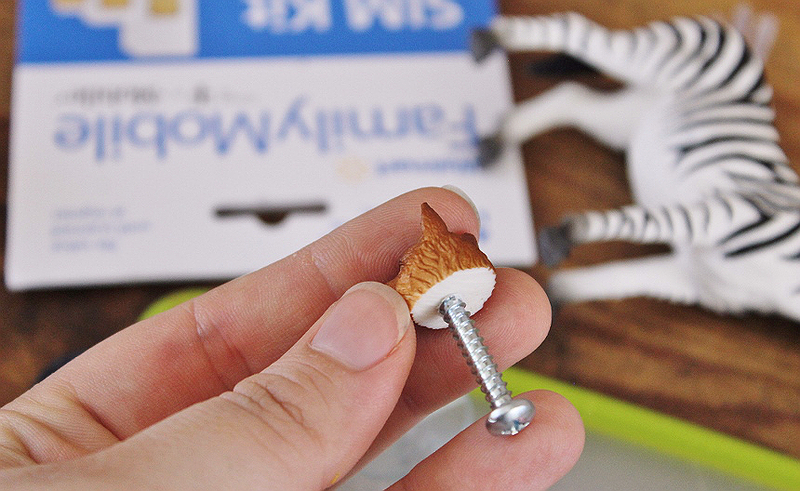 Use a drill bit to carefully create a small hollow on the inside of your animal's head for your dust plug to rest in and glue it in place. Depending on the materials you may need to use hot glue. Male sure your suction cup has a flat back and glue it to your animal's neck/body. Viola! 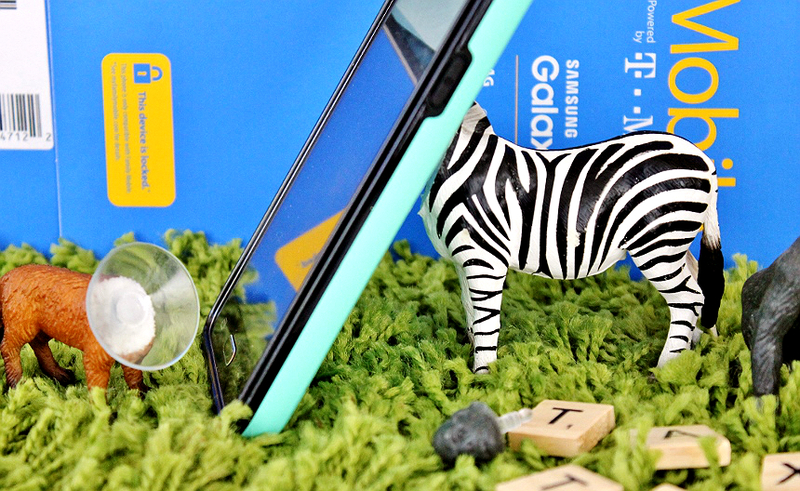 Instant animal accessories for your smartphone! 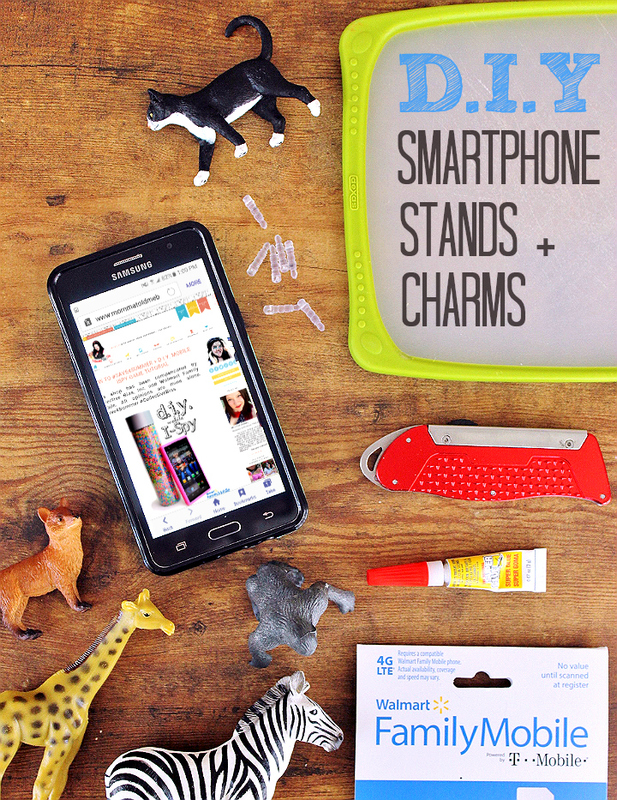 After making your own smartphone stands and charms you might be feeling pretty smart- I know I sure did. But there's nothing smart about paying too much for your smartphone service. Or, even worse, paying too much for too little service. On top of patting yourself on the back when your bill comes in each month, Walmart Family Mobile even gives you that extra reason to celebrate with the FREE VUDU credit (a $7 value, the equivalent of a new release) so you can spend some serious family time celebrating each month as well. 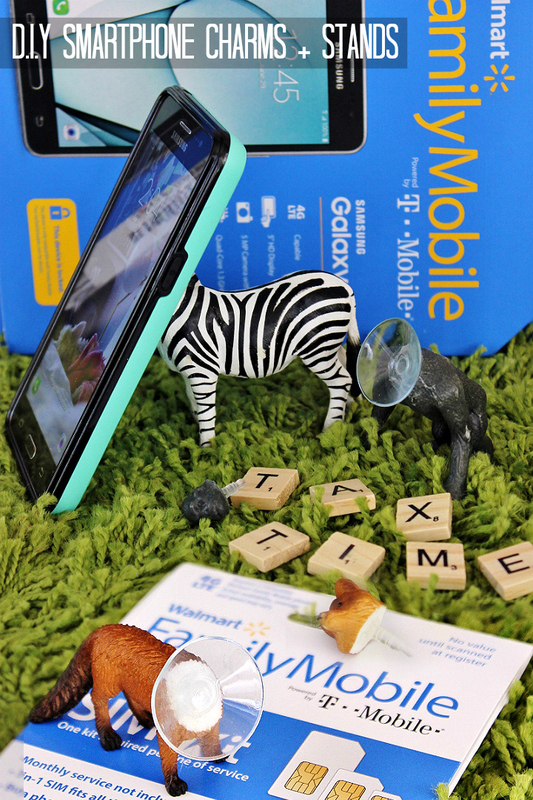 Yes, Walmart Family Mobile is kind of a tax time tradition in our home- upgrade our phone, upgrade our plan- we always find a way to max our taxes just a little more with Walmart. Now, tell me, are you paying taxes or enjoying a refund this year? What Daughter Says: Whether you're paying or getting money back this tax season, max your tax dollars with smart decisions such as a great mobile plan. Oh my gosh - those are the cutest things ever. I'm going to have to make a dozen of them. Honestly, when you have a local Walmart, you hardly ever need to go anywhere else. These Walmart plans sound great. I have three kids, and they're all old enough for phones. That is A LOT of expense. That is an interesting way to make a holder for your phone. Kind a like it because it's really creative. They're really cute! I go to Walmart for just about everything. Tax time is always stressful even if I am getting money back. The Walmart Family Mobile looks great and I will keep that in mind with my next plan. My daughter will love those phone holders. I need to look into this. My kids are getting to the point where they need/want their own phones. They will be at sports practices by themselves and I don't like them there without communication. A phone stand is exactly what's been missing from my life. I need to make one STAT! These stands are so adorable! I totally need this in my life to help me out. 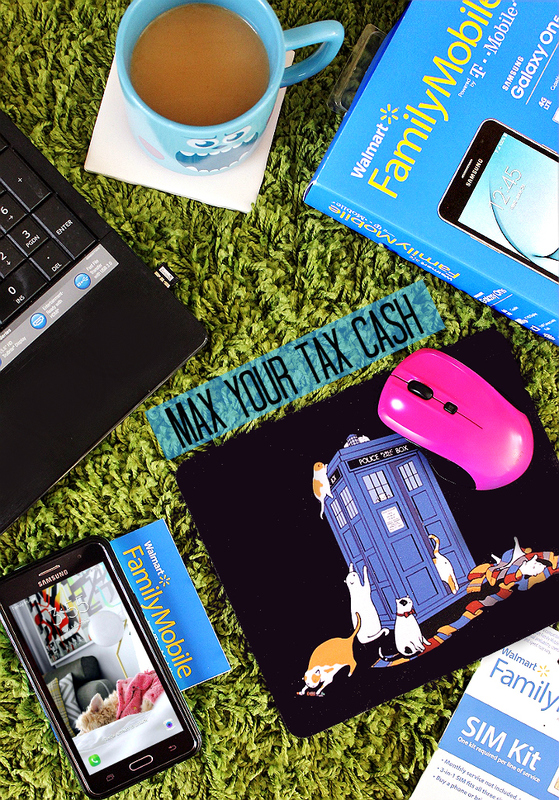 I love your Tardis mouse pad. 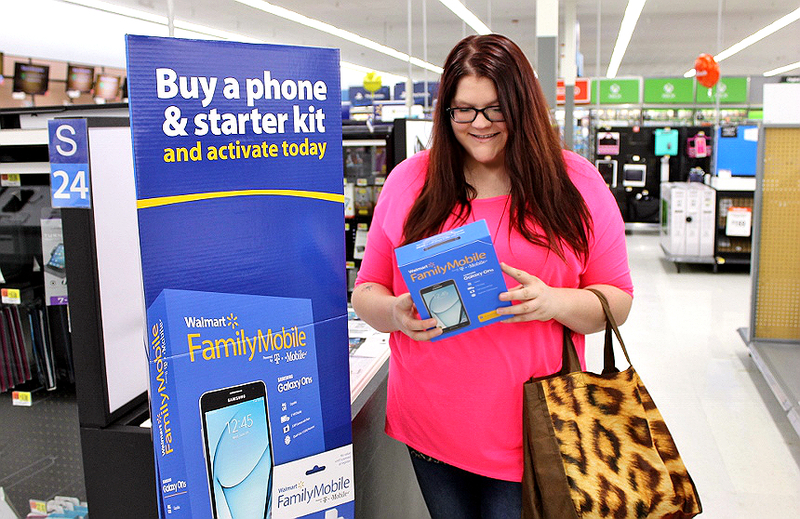 Walmart Family Mobile sounds like a great place to get a new phone. I will have to look at the plans when I go.I want to switch to a family plan to save some money. I'm just glad you didn't decapitate a goat....heh. They are very cute, though. I wish the plan was available here in the boonies. I keep looking but not yet. My husband says it's because there are just not enough of us living out here. Walmart Family Mobile sounds like a great plan. I'm always paying in at income tax time. The joys of being self-employed. 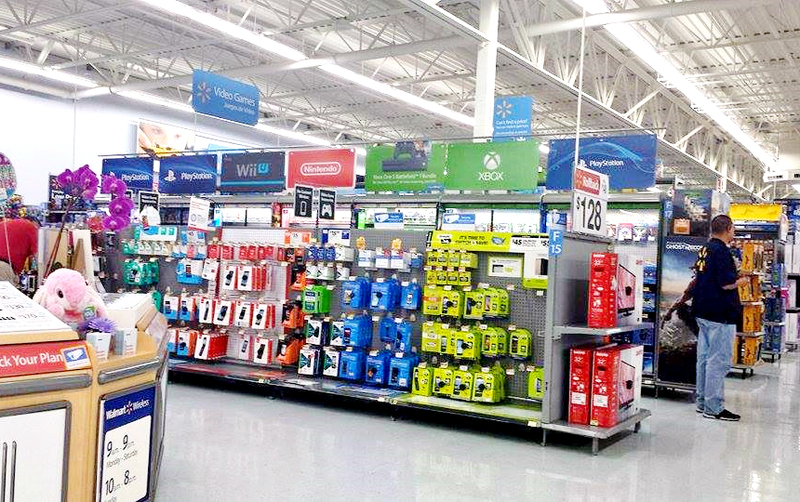 Walmart seems like a great place to get phones. What a great plan Walmart is offering. I live in the wrong country it would seem when it comes to cell phone plans. That is a great way to make a holder for your phone. I like it because it's very creative. They're really cool! Walmart Family Mobile has some great deals on their phones. This is a great way to get a decent phone if you don;t have much money. They have a good selection of phones, too. OK... 1. I LOVE that stand- what a fun idea!!! And YES- getting a great mobile plan is so important!!! I am going to look into these for the family! This is an awesome idea for a phone stand! Also an awesome idea on making the mos of your tax return - I have tween begging for a phone that I just may have to get! I love these so much. I can see if you use dolls or super hero figures. How do you think of this stuff seriously? I have never heard of Samsung Galaxy on5 is that a Walmart special. I noticed in one of the pictures that it shows a girl's hand holding a phone and I couldn't help but notice the cute little heart drawn on her wrist, but the I noticed what looks like self harm scars. I mean no offense and I'm definitely NOT trying to shame her for showing her scars, it can be a difficult and sometimes painful thing to do. I praise her for being so brave and courageous as to show them as well as draw a little heart near them, it shows progress. Accepting yourself, scars and all, is one of the first steps to recovery. Anyway, I just wanted to share what I noticed and give praise where it's needed, encouragement can make someone feel better than you think, sometimes people just need support and someone to be there. Today we bring to you a list of upcoming smartphones that are worth waiting for. We bring you 6 android smartphone, one of which could end up being the smartphone you choose to buy.